The main function of portable water circulation system is to actively cool the test mock -ups (loads) which are supposed to receive heat loads that represent normal and off - normal thermal conditions. 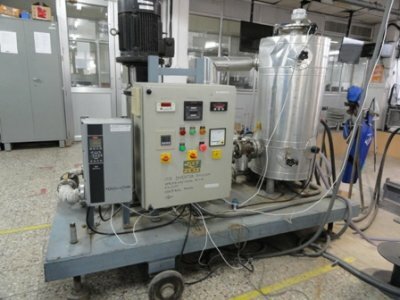 The PWCS typically consists of components such as high-pressure water pump with a control unit, corrosion resistant (stainless steel) water tank with built-in heater for heating and storage of water, calorimetric (temperature, pressure and flow rate of water) monitoring & diagnostic sensors, display unit and feedback control system. 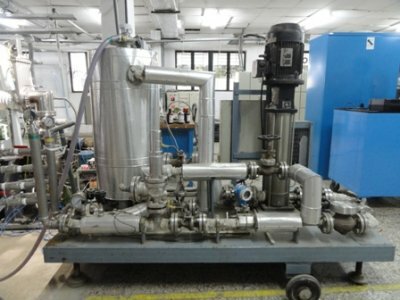 The operating parameters of the system is to circulate water at high pressures up to 20bar, high temperatures up to 80 deg C and high flow-rates up to 100 LPM through test mock-up tubes having inside diameters in the range 10mm-25mm and length up to 500 mm.